I’m lucky enough to be invited along to the local independent theatre in Nottingham every so often to see one of their performances. Last week it was ‘My Judy Garland Life’ and I was really keen and quite looking forward to it. I’ve loved Judy Garland and have been intrigued by the drama and ultimate sadness in her life for a long time. I also thought this one might have a bit of singing in it, which I knew was going to be good for me! My Judy Garland Life, written by Susan Boyt and adapted by Amanda Wittingham tells the story of hero worship and celebrates the relationship between a star and a fan. Following Judy through different periods of her life and career, scenes cleverly linked Judy and Susie through time, showcasing the turmoil and tribulations that each was facing. It was cleverly retold although at times slow to unfold and fully appreciate, but the second half truly brought this relationship to its climax with drama, laughter, tears and heartache. The show is based on the book, My Judy Garland Life in which Susan Boyt tells of her love and adoration of Judy, and how she helped her through dark times in her life. 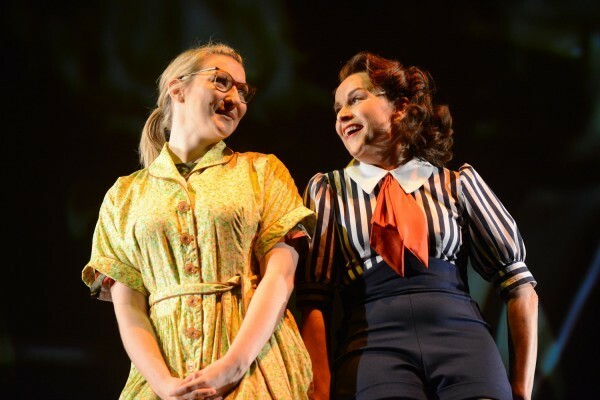 The adaptation is beguiling and moving, with stunning performances by both Sally Ann Triplett as Judy, and Faye Elvin as Susie. I came away believing that I’d just seen Judy Garland, or was it Liza Minelli, in the flesh; Sally Ann’s performance was just riveting. Her mannerisms and characteristics were uncanny, and her singing was just divine. Her portrayal of both Judy and Liza showed depth and talent making me want to find out more about Judy’s life. Judy Garland worked for 45 of her 47 years. She worked for 15 years at MGM generating the greatest Hollywood, platinum coated musicals. She received an Oscar for her role as Dorothy in the Wizard of Oz, in 1940. It was in 1950, exhausted, underfed and overworked she was released from her MGM contract. In 1951 she opened her show at the Palace Theatre which ran for a record breaking 19 weeks. In 1959, whilst in London she was hospitalised with Hepatitis after years of dependency on drugs for weight loss and insomnia. She was told she would never work again. In 1961, after a 42 night tour, she played New York’s Carnegie Hall, the recording of which was awarded 5 Grammys and is generally regarded as one of the greatest performances of all time. It cemented her return from illness. She spent most of the 1960’s touring, making a few movies, in order to pay off crippling debts accumulated through severe mismanagement of her finances. 22 June 1969 Judy Garland dies in her home in London from a drug related problem. It was a clever way of giving the audience an insight to an amazing, vibrant but fragile Judy Garland. The music was introduced in a creative way, I was surprised how many of the songs I recognised! The star of the show had to be Sally Ann Triplett who played Judy, she had fantastic energy and a wonderful voice. I had no idea what to expect and I was really delighted. I particularly loved the performance by Sally Ann Triplett and I’m happy to make believe that I spent the evening in the presence of the real Judy Garland. Obviously I went home and googled where you can get those red shoes. So you can see how much of an impact this had on us! My Judy Garland Life is showing at the Nottingham Playhouse until February 15th so if you fancy grabbing a ticket check out the website here. Tickets cost between £7.50 and £27.50.